The Republic P-43 was a single-engine, all-metal, low-wing monoplane fighter aircraft first delivered in 1940 to the United States Army Air Force. The Seversky Aircraft Company, which in 1939 changed its name to the "Republic Aviation Company", constructed a range of one-off variants of its Seversky P-35 design that featured different powerplants and enhancements, with the designations AP-2, AP-7, AP-4 (which flew after the AP-7), AP-9, XP-41; and actually built a carrier-based version designated the NF-1 (Naval Fighter 1). None of these variants went into production and are of little interest, but the AP-4 proved significant in the further development of Seversky aircraft. It featured fully retractable landing gear, flush riveting, and most significantly a Pratt & Whitney R-1830-SC2G engine with a belly-mounted turbo-supercharger, offering 1,200 horsepower (890 kW) and good high-altitude performance. The exhaust-driven turbosupercharger had been refined by Boeing as part of the development program for the B-17 bomber, and the opportunities offered by it for improved performance were of great interest to other aircraft manufacturers. The one AP-4 built was used as a test platform to evaluate means of improving the aerodynamics of radial-engine fighters. It was fitted with a very large prop spinner and a tight-fitting engine cowling, following similar experiments that had been performed with the first production P-35. The AP-4's big spinner was later removed and a new engine tight cowling was fitted. Unsurprisingly, these measures led to engine overheating problems. On March 22, 1939, the engine caught fire in flight, the pilot had to bail out, and the AP-4 was lost. Despite its final loss, the USAAC liked the turbo-supercharged AP-4 demonstrator enough to order thirteen more in May 1939, to be designated YP-43. However, USAAC requirements led to many modifications, and the YP-43 ended up looking much different from the AP-4. The YP-43 was powered by a P&W R-1830-35 14-cylinder Twin Wasp radial engine with turbo-supercharger, offering 1,200 horsepower (890 kW) and driving a three-blade propeller. Armament consisted of two 12.7 mm machine guns in the nose, plus a single 7.62 mm machine gun in each wing. The cockpit scheme was revised, leading to a distinctive "razorback" configuration, as it would later be called. 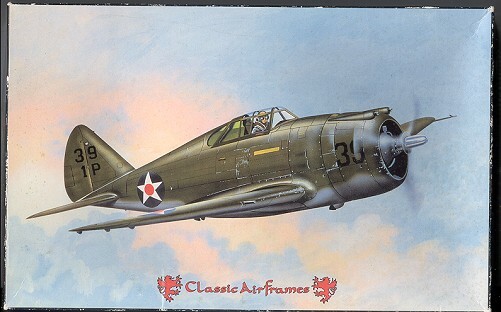 The first of the thirteen YP-43s was delivered in September 1940, and the last was delivered in April 1941 when the USAAC planned to purchase Republic's proposed successor design, the P-47B. However, delays occurred in the XP-47B program, so the Air Corps another batch of 80 P-43As, with a slightly different engine fit. Further delays led to yet another order for 125 P-43A-1s intended as Lend-Lease aircraft for China, with this last batch featuring armament of four 12.7 mm machine guns and self-sealing fuel tanks. Including the thirteen YP-43As, a total of 272 P-43s of all types were delivered by the time of the last delivery in March 1942. The ultimate fate of all these aircraft is a bit fuzzy, mostly because the "Lancer", as it was known, was so forgettable. At least 51 did make it to China, and some served with Claire Chennault's American Volunteer Group, the "Flying Tigers". In combat, the P-43 due to its turbo-supercharger enjoyed much better high-altitude performance than the Curtiss P-40 that was the mainstay of the Flying Tigers. The P-43A was faster than the P-40E above 6 km, and had a much better climb rate above 3 km, too. To capitalize on its strengths, the few available P-43s were often used as top cover for the P-40 fighters. However, the P-43's turbo-supercharger was unreliable, the tanks were prone to leak, and as the P-43's R-1830 engines were in high demand by the numerous Douglas C-47 transports in the theatre, they were grounded rather quickly, leaving only the obsolescent P-40 to deal with the latest Japanese high-performance fighters like the Nakajima Ki-44. Most of the P-43s that were not sent to China were converted into photo-reconnaissance aircraft, and a handful of these photo-reconnaissance Lancers were provided to Australia. These aircraft appear to have been given designations such as P-43B, P-43C, and P-43D, with all then redesignated RP-43, (where the "R" stood for "restricted from combat") in the fall of 1942, but the details are unclear. The type saw little combat in any capacity. The P-43's only real significance was as a stepping stone to something better, and a way of keeping Republic's production lines going until they could deliver the new XP-47B. This is one of Classic Airframe's earlier products, dating from the mid-1990s, however, it still shares several traits with even the newest of their releases. 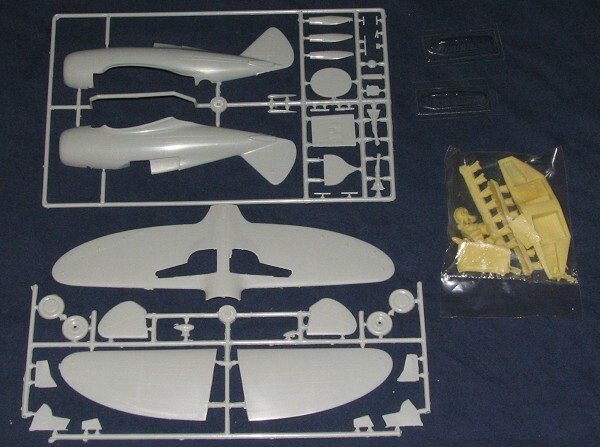 It is molded by MPM and has very finely scribed detailing, some of which will disappear under the inevitable filling and filing that will be required to complete the model. It relies on resin parts for the finely done detail bits and this includes wheel wells, the engine (which consists of a central core, front piece and 14 generic cylinders). The prop hub is in resin into which the three injected plastic blades are attached. Other resin bits are the cockpit side walls, control stick, seat, and gun sight. The turbo-supercharger waste gate is also resin as is the tail wheel strut and a few other bits. Thanks to the age of the kit and all the jostling it has been put through over the years, there was some damage in the resin bag. Also typical of the time is a photo-etched instrument panel and a piece of acetate with the instruments printed on it. The plastic bits are fairly well done with rough edges and some sink areas in the thicker pieces. The main landing gear legs are particularly rough with considerable flash that will need trimmed off. The engine cowling is integral with the fuselage halves. This will cause some difficulty in getting the two join seams properly cleaned up and looking like a single piece. The kit is topped off with a pair of somewhat thic k vacuformed canopies. I find it rather odd that the frame lines are actually clearer than the rest of the canopy so if you want the interior to be properly appreciated, you'll have to do some cutting. The back portion of the canopy also includes some of the outside skin of the aircraft so that should help to smooth things out when installing it. Instructions are fairly good and adequate to complete the kit, though are not as well done as the more recent issues. All color information is generic in nature. 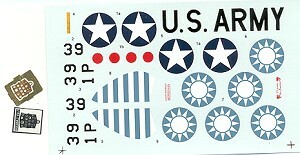 Markings are well done and provide schemes for two aircraft. One is a rather generic Chinese AF version and the other is a nearly equally generic 1st Pursuit Squadron plane from 1941. Both are in Olive Drab over Neutral Grey. While I'm sure that the build will be rife with fit problems and much trimming and sanding, it will make into a very nice representation with an equal amount of effort on the part of the builder. One thing for sure, it is the only P-43 kit done in this scale and though out of production for many years, is quite sought after. Because of the undoubted difficulty of construction, this kit is not recommended for the beginner.